I’d like to thank my friend and fellow dietitian for sending me the link to this hilarious infomercial for the NutriBullet. I just sat in my office and watched the entire 26 minutes in between clients. You know the saying about laughter being the best medicine? Well, I’ve definitely gotten my dose for the day! Perhaps you don’t have time or inclination to watch the video yourself. Don’t worry, I’ll give you the highlights. I just want to begin by saying that the notion of a “superfood nutrition extractor” is complete and utter nonsense. In fact, by “pulverizing food on a cellular level” you may actually be depriving yourself of the benefits of intact fibre. 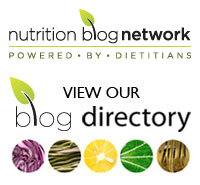 What is the NutriBullet? It’s not a blender or a juicer. It has “exclusive cyclonic action” and uses “turbo extractor blades” to “unlock the nutrition so your body can actually absorb it and use it.” Umm… I’ve got news for the makers: our bodies have this amazing system that does the same thing. It’s called the digestive system. Yep, our bodies are amazing machines and do a pretty good job of breaking down foods and absorbing the nutrients. True, we can’t break down whole flax seeds but you can buy those milled or grind them up yourself. The spokesperson for the NutriBullet is David Wolfe. You may remember him from such hokey productions as Food Matters. I looked him up as his title “longevity and nutrition expert” provided very little insight into his qualifications. Surprise, that’s because he has none. In the infomercial he tells us that “both my parents are medical doctors” as if that’s supposed to impart him with some credibility. Well, my dad’s a doctor of history and he can attest to the fact that I am not expert on historical matters. According to the infomercial the NutriBullet will: “supercharge your metabolism” and “reverse aging” among other outlandish claims. There are testimonials from individuals with various medical afflictions. I think that my favourite was from the cancer survivor whose hair started regrowing after just two weeks of using the NutriBullet. Obviously this regrowth must have been a result of use of the NutriBullet, not the cessation of treatment. I’m not saying there’s anything inherently wrong with this contraption. I do think that there’s something inherently wrong in making unsubstantiated claims regarding miraculous health benefits regarding the use of the NutriBullet. Tags: David Wolfe, infomercial, NutriBullet, nutrition, superfood | Permalink. Hi, yes, I don’t believe any of those claims. However, what I do believe is that nutribullet makes eating a lot of stuff I would otherwise not eat much easier. I like those green smoothies, but in general dont like eating salad. Even fruit. I dont like chewing many things, teeth have some pain. So the question is, do you still get the same nutrition from the output of the nutribullet as you would from the input to it? I don’t believe it makes nutrients any *more* accessible, but does it make them *less* accessible in some way, by breaking them down and destroying them, or making them not accessible at the right point in a natural digestive process? And also, does it break down the fibre so that it does not serve as roughage? I doubt that it does, since you can already get powdered fibre that acts as roughage, which is obviously itself rather broken down. Thanks. I’ve been seeing these so-called “food extractors” and could not figure out what made them different from blenders. Did a Google search for “food extractor nonsense” and… here I am. I really have no trouble eating whole fruit and vegetables so I don’t need to “extract”, juice or even blend them. I was just curious and figured there was probably some pseudo-science behind them. I’m so glad to hear that you landed on my blog with that search. I hope you were satisfied with my post! I concur, great work Diana. Your post was succinct, jargon free and hit the nail on the head. Looking forward to reading more of your blog. After researching several reliable sites, I came across a lot of article that pretty much say the same thing: that the body does the job of digestion. I have to add that seeing your post and seeing the sensational language that the commercial espouses in quotes is enough to discredit the Nutribullet’s claims alone! Thanks Jon. It always pays to do your own research! Does it seem to you that another popular product, the Nina Pulse, is any worse / better, in terms of the nutritional benefits od using it? I’ve never heard of this product and a google search has yielded no results. I would assume that if it’s any sort of blender then it would be quite similar. The only thing that might be different is that the nutribullet can breakdown whole flaxseeds. I can’t tell from the website if the ninja can. However, the multiple attachments make the ninja appear very useful as a kitchen appliance. Hope that helps! I’ve just seen the infomercial and agree 100% with your blog :) While blending foods seems like a good way to get nutrients in to your body, it’s not as good as it sounds, reason being is that it’s the livers job to process nutrients and get them into your body to be used and the liver can only process a limited amount at any given time, storing any excess as fats. The digestive system does a brilliant job of delivering nutrients to the liver to process without over whelming it, which processed foods can do, if you have to much. Glad to see some common sense instead of hype and empty claims! It was the “cellular level” nonsense that brought me to your page. Plants are made of cells, so at what other level could they possibly be broken up? Subatomic? Ha ha! The next big trend in food: subatomic nutrient extraction! By the way, from the reviews it does sound like a decent, inexpensive, and convenient “extractor” (blender), albeit perhaps not especially durable. I’d give it a try based on convenience alone, but I’m not expecting it to change my life. Thank you. The thing about fi re destruction was my first thought when I saw the ad on TV. Unfortunately, the opinions of so many uneducated people about the Bullet has made it difficult to extract whether the machine does destroy the fi re or whether the whole breaking down at cellular level is also an overstatement, which would actually be good, as I would love something quick easy and convenient to make healthy food that my kids might actually like… How can one find out? Thanks for this post. I’m really impressed with this. Hope you don’t mind if I share it. Since I first heard of Nutribullit I had my doubts about it. Speaking as a Health Coach training people in fitness and nutrition I actively discourage people in using Protein Shakes. This is because they are processed food and that our body’s break down food naturally, just like you say in your post. I think we have still to see the adverse effects of this product. Time will tell. In the nutrition world we tell people to eat naturally, local produce, that is as organic as possible with as little time spent going through a machine. The machinations of food in a Nutribullit, makes it another processed food and should be discouraged from use. That “the body does a pretty good job of digestion” is itself pseudosience. And, that it can digest whole flax seeds isnt isnt completely true. Check your poop. Regardlesx you fail to mention the millions of Americans on acid supressing medications for reflux and heartburn that do not digest normally. Revisit my post, Robin. I said that the body cannot digest whole flaxseed. Regardless, your comment about acid reflux is unrelated to the alleged merits of the blender.